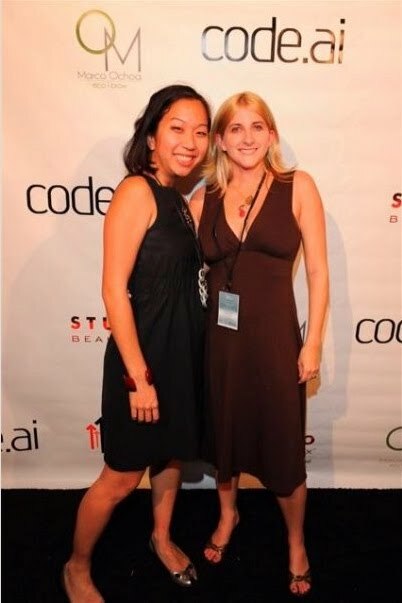 A few weeks ago, I blogged about using the prescription free lash and brow growth product called code.ai, and recently was able to attend it's launch party at Fred Segal Studio Beautymix in Santa Monica. They set up a red carpet in the popular luxury store and several bars were set up in their beauty aisles serving U’Luvka Vodka and a buttery La Parra Loca Sauvignon Blanc-Verdejo from Fresh & Easy Market, which definitely made for a fun event. Since I knew that celeb brow threader Marco Ochoa would be at the party and doing threading, I purposefully grew out my eyebrows using the code.ai brow booster ($75) so that he could reshape and have something to work with. I've been also wanting my arch to be more pronounced, so took this as the perfect opportunity. I had never had my brows threaded before only waxed or plucked and I was surprised to find that it didn't hurt. My eyes still watered up nonetheless, but that's because I'm a baby though. He also increased my arch and left my eyebrows looking perfectly sketched on. Also at the party was 7th Heaven's Actress Beverly Mitchell and Fernanda Romero from Drag Me To Hell and The Eye. You can read more about the party from my girls at Caroline on Crack and Shop Eat Sleep. P.S. - Bev Mitchell is darn. freaking. cute. Sorry, I was too tipsy to remember, plus my makeup was running from my watery eyes. :-P You can see them though in that photo of Ester and I, just not close up. Hello! Where are the before/after pics???? What kind of blog queen are you without pictures!? Sounds like a fun night. Rosa and I have been using code.ai for a couple of weeks and it is awesome! <--feels left out for not having an Eyebrow Shaper. I formerly had a great barber who would trim them up nicely, some 'brow manscaping.